Ubuntu has been the most popular Linux distro for desktops for a long time and now the percentage of web servers running Ubuntu nearly doubled in a single year. Ubuntu runs on 4% of all web servers now. That figure was 2.6% only an year ago. 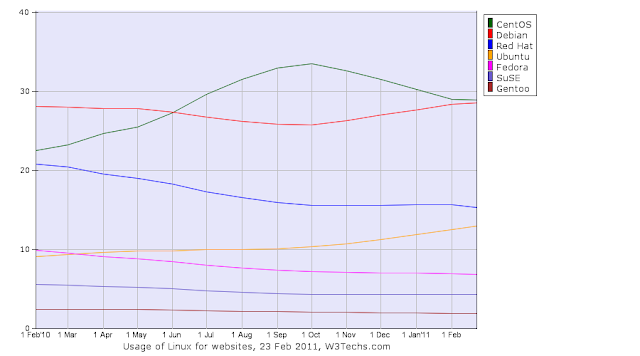 As you can infer from the graph above, Ubuntu is also the fastest growing among other popular Linux distros. This makes Ubuntu the 4th most popular Linux distribution on web servers, after CentOS, Debian and Red Hat, but it is that one that was steadily increasing over the last year. Some very well known sites that run Ubuntu include Archive.org, Sitepoint.com and Ea.com. 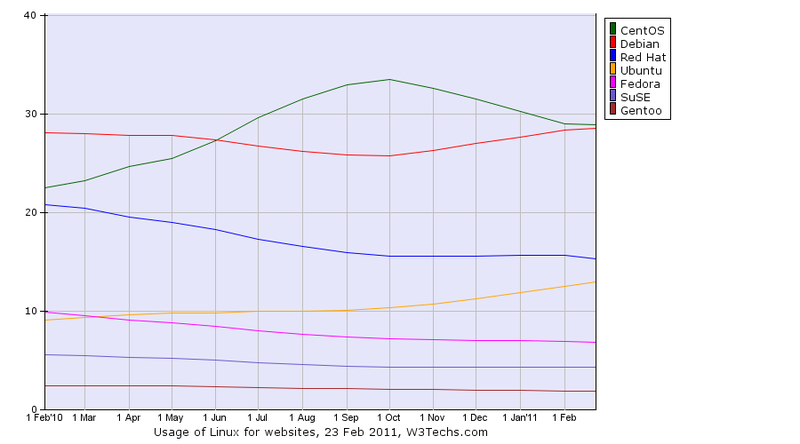 W3techs.com's report also shows that Ubuntu is even more popular amongst the top 1.000 sites with a 4.5% usage rate. Looking at the geographical distribution as indicated by top level domains, the study suggests that Ubuntu has a high market share in most of Europe: Germany (9.5%), France (8%), Sweden (11%) and Hungary (12.5%), whereas it is not as much used in Asia: Japan (0.7%), China (0.8%), India (2.1%). The corresponding figure for USA (3.3%) might not be as reliable, because the .us domain is not necessarily very representative for the US market.